Not much new stories to tell, I’ve been quite busy with some bureaucratic stuff over the last days. You know, annoying paperwork and so. Apart from that, we had some really good days here and I would say we have the first signs of spring weather. The husband of my mother and me went to the garden last sunday and we saw first flowers and noticed the first warm sunbeams. I didn’t take much pictures that day, I maybe have some on my phone. But I have a new photo of Shyna for you as you can see above. With more sunlight, I can now again take better photos near the windows of my apartment. I love to make use of the sunlight and the photos are much better than compared to photos I took last autumn and this winter. I mentioned already that I teach my cat some tricks. 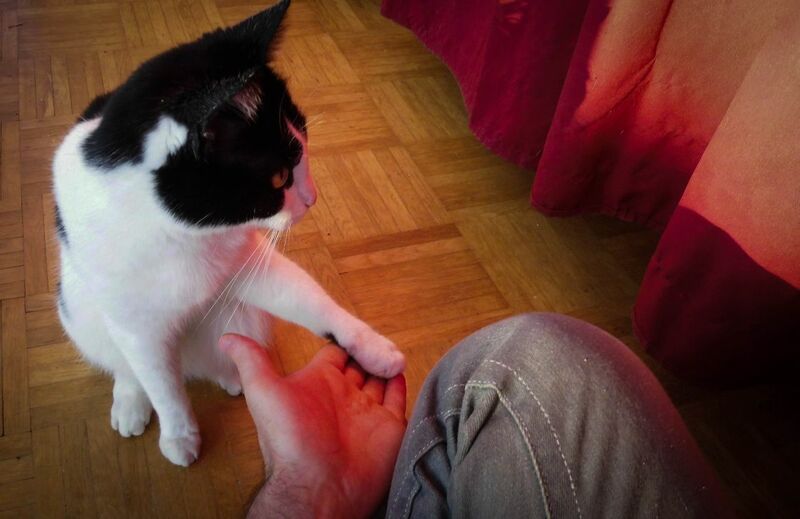 The handshake is one of the tricks she understands as I mentioned a while ago too. It’s good to use the trick when you want to have a funny photo with your cat. And in my opinion it is not bad to teach cat tricks. I do also like how the sunlight reflected the colours of my red curtain on my hands and on her fur. It’s not always good, but in this case I do really like the effect as it looks interesting anyhow. I like the photo, it’s a snapshot, but a good one. Do You Listen Music While Doing The Housework?